Ever had a place catch your eye, but never the time to stop and check it out? Well, Restoran Setapak Teochew has always been sidelined, not by choice but due to the fact that we are always rushing off to some other place, and always just missing out eating here for some reason or other. Cumi says “Look! it’s so packed .. we really need to try it”. I’m like “Sure, the next time we pass by this way, we must”. 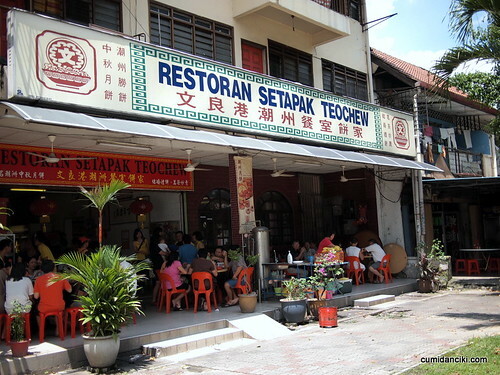 Well today is finally “that day” cometh, and today we get to eat at Restoran Setapak Teochew. 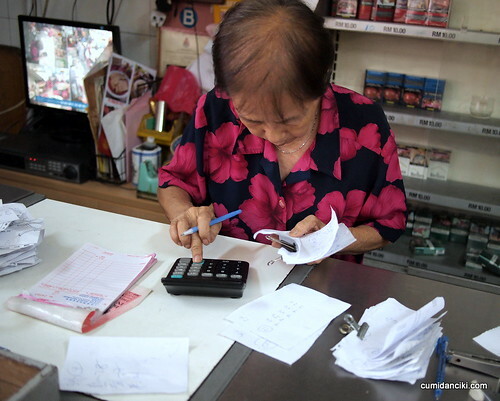 Mr Ng, the owner, says that his restaurant has been around since 1912, which makes this shop exactly 100 years old this year. Wow, isn’t that something. 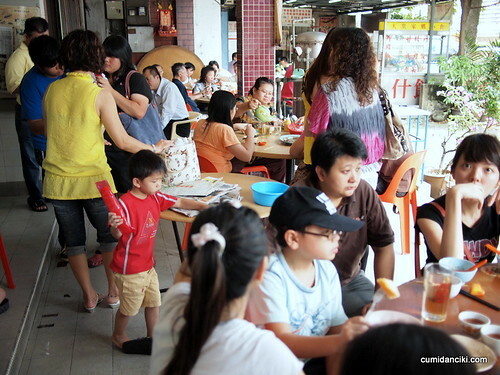 Yes, Ng’s family had been doing business in Setapak for four generations and the place is still packed to the rafters. We had to wait a good 10 minutes before we could find a seat.. don’t even talk about the waiting time between ordering and actually being served. 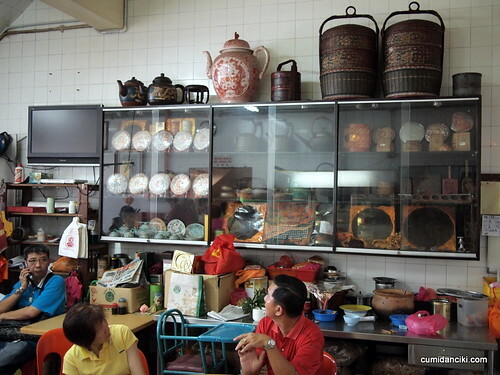 The speciality here is of course, their own homemade, Teochew style fried noodles. They do Teochew noodles in every variety here. They serve a fabulous signature white bihoon (vermicelli), and the Hokkien mee (flat thick yellow noodles fried in black sauce) is also another hot favourite. 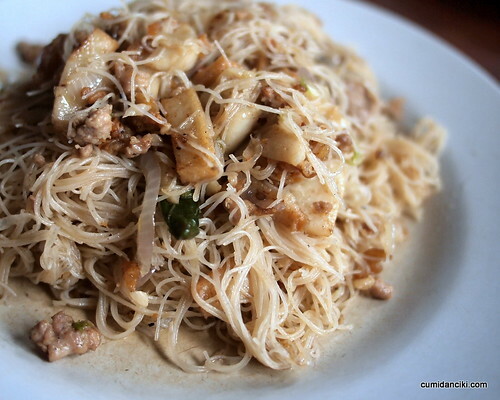 The reason why the white bihoon noodles look that way, is because it is not adulterated with any black sauce. Still, the dried baby shrimp, fish cakes and meat, work together, better than you can imagine, to impart a wonderful flavour and aroma to this fair-colored noodles. 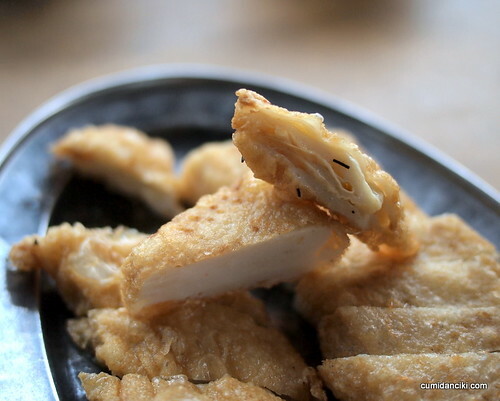 Initially, when I first walked past a table eating the white bihoon, I took one look and told Cumi that it looked rather anaemic and I thought it probably tasted flat. Which just goes to show- never judge a noodle by its color. 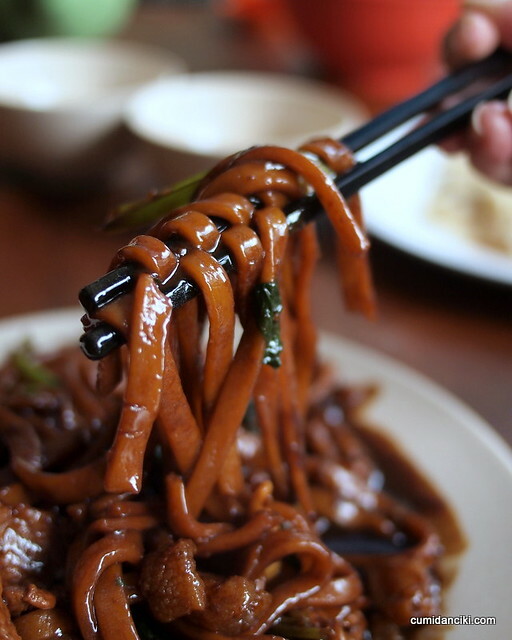 The Hokkien mee itself is of the thick strand variety – something that’s getting more scarce and hard to find in KL these days. Those who have grown up with the “dai loke meen” will appreciate the texture and generous girth of these noodles. Fried up with the lard and allowed to braise and simmer till the noodles imbibe all the dark sauces and flavours, this Hokkien mee is definitely in our Top 5. The foo chok served as a starter is of standout quality too. 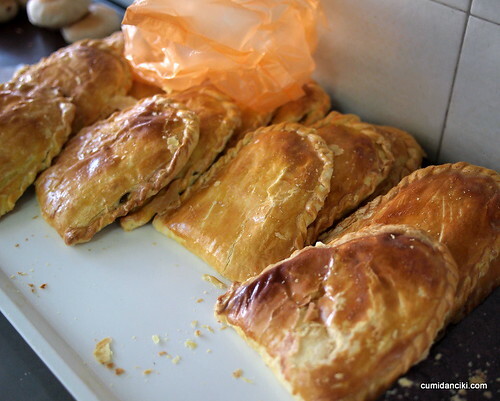 You will see from the photo below that the foochok is of the softer sort, and they fold up the sheets upon each other before they deep fry it. The layering of the foochok sheets is what makes it so special. The other thing this place is famous for are their biscuits. 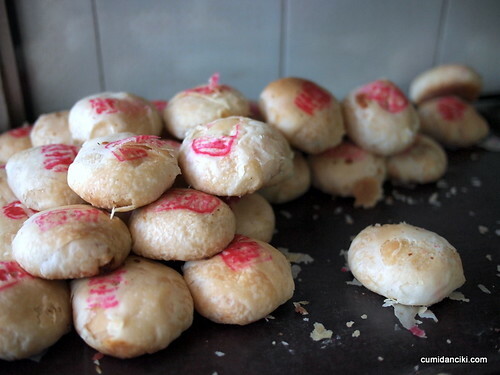 Hokkien wedding biscuits, mooncake biscuits, you name it -they’ve got it. 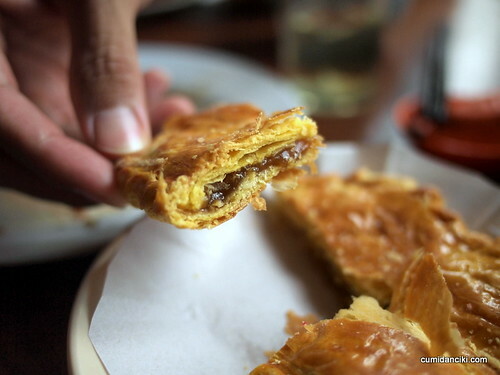 Cumi tried the kaya kok (a pastry biscuit filled with sweet kaya jam) but the flavour was just so-so. It lacked aroma and was on the sweet side as well. Grandma does the accounts.. Don’t mess.. Directions : Head towards Setapak. After Tawakal hospital you will see a row of shop houses on your right. You will need to do a U-turn further up at the traffic lights, as the shop is on the opposite side of the road. a 100 year old restaurant, what an establishment! I’m sure you’ve been Nips? We used to eat at this place back when we were living in this part of town and they were very packed then! Looks like biz has been consistent, if not flourished! 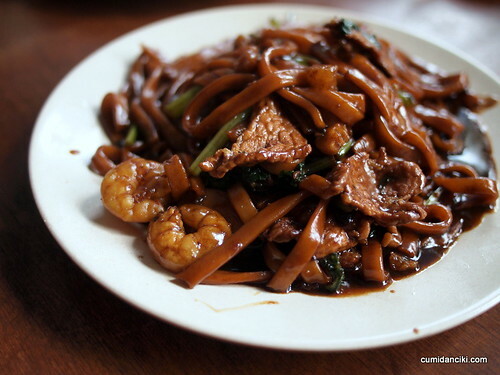 Those meehoon and kwayteow are cooked the good ole “homecooked” style – yummz! still good chris! We love the noodles here. Some ppl say it has dropped in standard but we found it fine.. superb! Wow. What a legacy! 100 years is epic! yeah, no dark sauce but heaps of flavour. It’s really amazing. Hokkien mee is fab. So are the other dishes! I’m actually a lot more inclined towards pale-looking food. 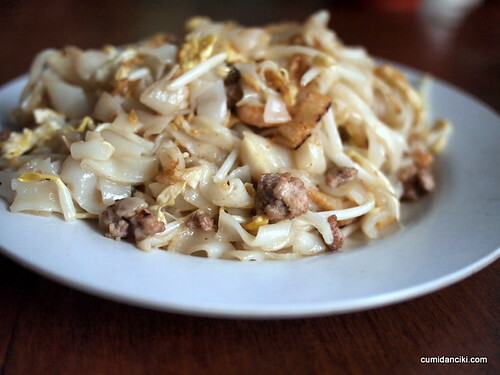 White beehoon & koay teow definitely stands out here, well over the Hokkien mee! Grandma so contemporary though – where be the 100-year old abacus? yeah look us up too love! Why the char kuey teow so pale? If you read the posts, it says, that it is pale because they don’t use dark sauce, dahleng..
good. look forward to your post! My inner Teo Chew wants to eat there already! So bila? Least Grandma embraces technology. No more abacus? Hokkien Mee and Chinese biscuits … I bet grandma won’t tell how much they make in a day either!! Hokkien Mee photos looks so nice. I love the Chinese biscuit and fishball.They sell all those in here, but I bet your taste better. 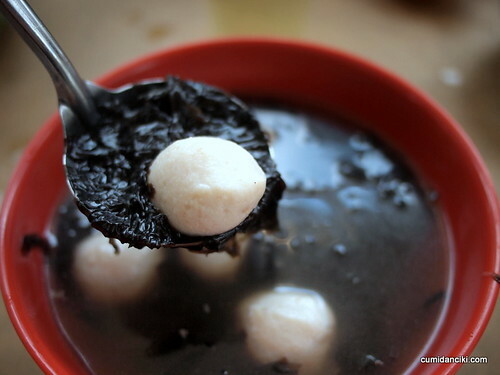 Fishball is one of my bf’s favorite because where he come from, they have that a lot at home. Really.. where is he from? oh wow, that food looks delicious. I’m hungry now!